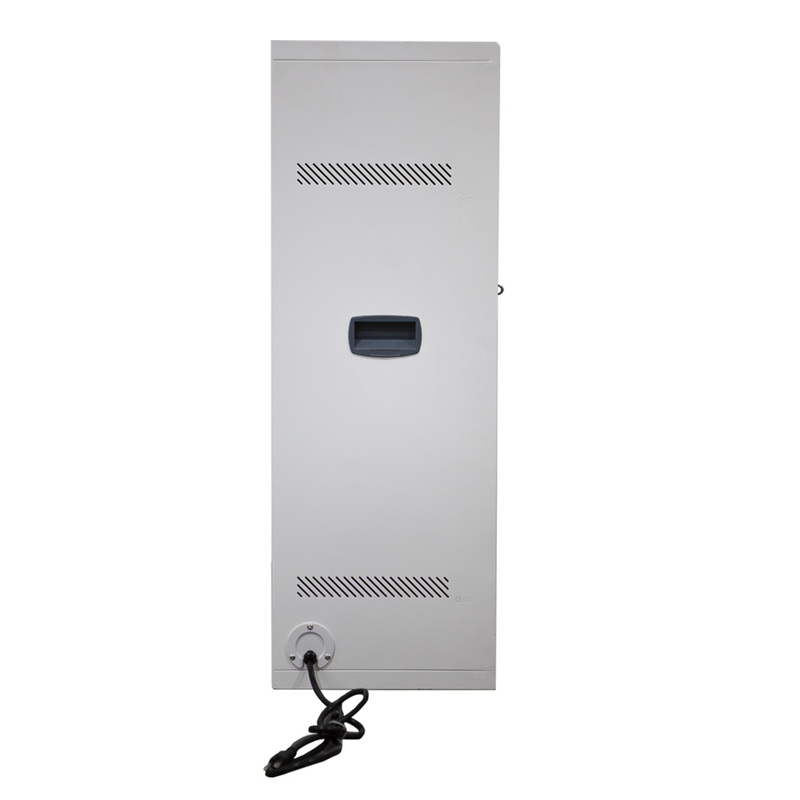 The AC-VERTICAL is designed to charge and store 16 Chromebooks, tablets or laptops. 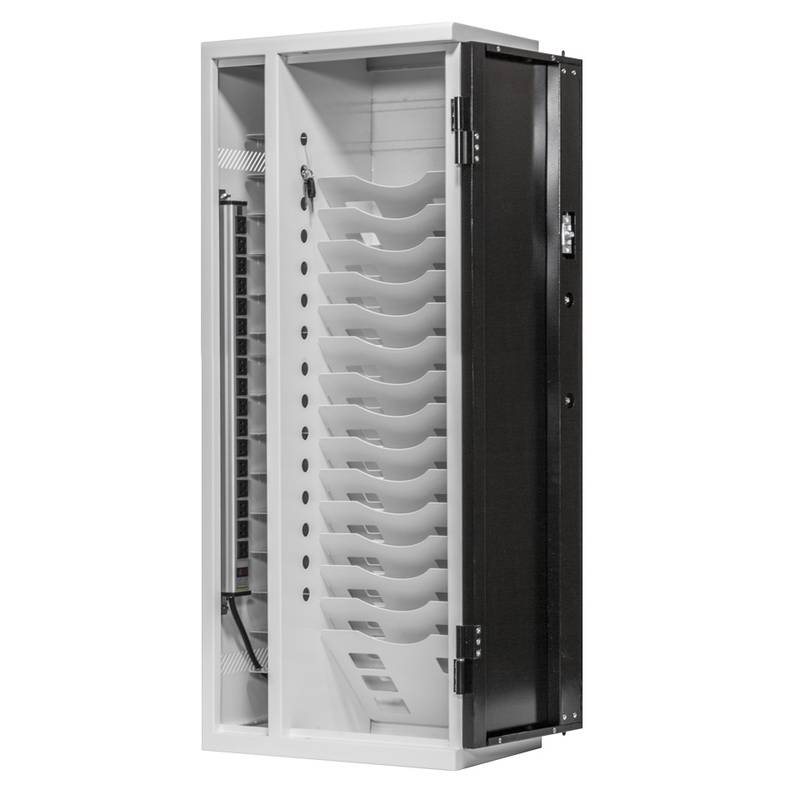 It features a 3-point locking door, wall mounting holes, and versatile bays allowing fitment of devices ranging from 9 to 14 inches. Not sure which cart will work best for you? We want to make sure you’re getting the right cart for your application and budget. Eligibility: Giveaway (the â€œGiveawayâ€) is open only to those who sign up on the online Giveaway page and who are 18 as of the date of entry. The Giveaway is open to public or private k-12 school district employees in the United States and is void where prohibited by law. Employees of Anywhere Cart (the â€œSponsorâ€) their respective affiliates, resellers, distributors, suppliers and their immediate family members and/or those living in the same household of each are not eligible to participate in the Giveaway. The Giveaway is subject to all applicable federal, state and local laws and regulations. Void where prohibited. Agreement to Rules: By participating, you agree to be fully unconditionally bound by these Rules, and you represent and warrant that you meet the eligibility requirements set forth herein. In addition, you agree to accept the decisions of Anywhere Cart, as final and binding as it relates to the content. The Giveaway is subject to all applicable federal, state and local laws. Giveaway Period: Entries will be accepted online starting on or about 2 weeks before the trade show and ending the final day of the trade show. How to Enter: Below are the methods to enter the Giveaway drawing. Enter once via the website: Submitting an entry using the online form provided on theÂ Anywhere CartÂ website. The entry must fulfill all Giveaway requirements, as specified, to be eligible to win a prize. Entries that are not complete or do not adhere to the rules or specifications may be disqualified at the sole discretion of Anywhere Cart. You may enter only once online per person and must fill in the information requested. Additional Conditions. For any reason you may request cancellation of your entry(s) within 5 days prior to trade show date of the drawing by contacting Anywhere Cart â€“ 42035 Zevo Drive Temecula, California 92590. Any incomplete or illegible entries will not be processed. The use of robotic, automatic, macro, programmed, photocopied entries, or multiple entries sent in bulk mail, or like methods (including without limitation the use of any promotion/sweepstakes subscription, notification entry or like sites or services that offers sweepstakes entry services â€œon behalf ofâ€ Entrant) is strictly prohibited. Any attempt by any participant to obtain more than the stated number of entries by using multiple/different email addresses, identities, registrations and logins, or any other methods may void that participantâ€™s entries and that participant may be disqualified. Use of any automated system to participate is prohibited and will result in disqualification. Sponsor is not responsible for lost, late, incomplete, invalid, unintelligible or misdirected entry applications, which will be disqualified and destroyed. In the event of a dispute as to any entry application, the authorized account holder of the email address, if applicable, used to register will be deemed to be the Entrant. All entries must be made in the name of the individual and no transfer of ownership of an entry is permitted. 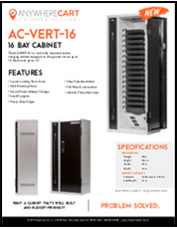 Prizes: Winners will receive an Anywhere Cart Charging Solution cart or cabinet to be determined at time of trade show. Actual product may differ at the time of prize award. The specifics of the prize shall be solely determined by the Sponsor. No cash or other prize substitution permitted except at Sponsorâ€™s discretion. The prize is nontransferable. Any and all prize related expenses, including without limitation any and all federal, state, and/or local taxes shall be the sole responsibility of the winner. No substitution of prize or transfer/assignment of prize to others or request for the cash equivalent by winners is permitted. Acceptance of prize constitutes permission for Anywhere Cart to use winnerâ€™s name, likeness, and entry for purposes of advertising and trade without further compensation, unless prohibited by law. Odds: The odds of winning depend on the number of eligible entries received in the Giveaway prior to the drawing date. Winner selection and notification: Winners of the Giveaway will be selected in a random drawing under the supervision of the Sponsor. Winners will be notified via the contact information provided on the entry form and via email to the email address they entered the Giveaway with within five (5) days following the winner selection. Anywhere Cart shall have no liability for a winnerâ€™s failure to receive notices due to winnersâ€™ spam, junk e-mail or other security settings or for winnersâ€™ provision of incorrect or otherwise non-functioning contact information. If the selected winner cannot be contacted, is ineligible, fails to claim the prize within 5 days from the time award notification was sent, or fails to timely return a completed and executed declaration and releases as required, prize may be forfeited and an alternate winner selected. The receipt by winner of the prize offered in this Giveaway is conditioned upon compliance with any and all federal and state laws and regulations. ANY VIOLATION OF THESE OFFICIAL RULES BY ANY WINNER (AT SPONSORâ€™S SOLE DISCRETION) WILL RESULT IN SUCH WINNERâ€™S DISQUALIFICATION AS WINNER OF THE GIVEAWAY AND ALL PRIVILEGES AS WINNER WILL BE IMMEDIATELY TERMINATED. Rights Granted by you: By entering this contest you understand that Anywhere Cart, anyone acting on behalf of Anywhere Cart, or its respective licensees, successors and assigns will have the right, where permitted by law, without any further notice, review or consent to print, publish, broadcast, distribute, and use, worldwide in any media now known or hereafter in perpetuity and throughout the world, your entry, including, without limitation, the entry and winnerâ€™s name, portrait, picture, voice, likeness, image or statements about the Giveaway, and biographical information as news, publicity or information and for trade, advertising, public relations and promotional purposes without any further compensation. Terms: Anywhere Cart reserves the right, in its sole discretion to cancel, terminate, modify or suspend the Giveaway should (in its sole discretion) a virus, bugs, non-authorized human intervention, fraud or other causes beyond its control corrupt or affect the administration, security, fairness or proper conduct of the Giveaway. In such case, Anywhere Cart may select the recipients from all eligible entries received prior to and/or after (if appropriate) the action taken byAnywhere Cart. Anywhere Cart reserves the right at its sole discretion to disqualify any individual who tampers or attempts to tamper with the entry process or the operation of the Giveaway or website or violates these Terms & Conditions. Anywhere Cart has the right, in its sole discretion, to maintain the integrity of the Giveaway, to void entries for any reason, including, but not limited to; multiple entries from the same user from different IP addresses; multiple entries from the same computer in excess of that allowed by Giveaway rules; or the use of bots, macros or scripts or other technical means for entering. Any attempt by an entrant to deliberately damage any web site or undermine the legitimate operation of the Giveaway may be a violation of criminal and civil laws and should such an attempt be made, Anywhere Cart reserves the right to seek damages from any such person to the fullest extent permitted by law. By entering the Giveaway you agree to receive email newsletters periodically from Anywhere Cart. You can opt-out of receiving this communication at any time by clicking the unsubscribe link in the newsletter. Limitation of Liability: By entering you agree to release and hold harmless Anywhere Cart and its subsidiaries, affiliates, advertising and promotion agencies, partners, representatives, agents, successors, assigns, employees, officers and directors from any liability, illness, injury, death, loss, litigation, claim or damage that may occur, directly or indirectly, whether caused by negligence or not, from (i) such entrantâ€™s participation in the Giveaway and/or his/her acceptance, possession, use, or misuse of any prize or any portion thereof, (ii) technical failures of any kind, including but not limited to the malfunctioning of any computer, cable, network, hardware or software; (iii) the unavailability or inaccessibility of any transmissions or telephone or Internet service; (iv) unauthorized human intervention in any part of the entry process or the Promotion; (v) electronic or human error which may occur in the administration of the Promotion or the processing of entries. Disputes: THIS GIVEAWAY IS GOVERNED BY THE LAWS OF the United States AND CaliforniaWITHOUT RESPECT TO CONFLICT OF LAW DOCTRINES. As a condition of participating in this Giveaway, participant agrees that any and all disputes which cannot be resolved between the parties, and causes of action arising out of or connected with this Giveaway, shall be resolved individually, without resort to any form of class action, exclusively before a court located in Californiahaving jurisdiction. Further, in any such dispute, under no circumstances will participant be permitted to obtain awards for, and hereby waives all rights to claim punitive, incidental, or consequential damages, including reasonable attorneysâ€™ fees, other than participantâ€™s actual out-of-pocket expenses (i.e. costs associated with entering this Giveaway), and participant further waives all rights to have damages multiplied or increased. Sponsor: The Sponsor of the Giveaway is Anywhere Cart â€“ 42035 Zevo Drive Temecula, California 92590. How Many Carts / Cabinets will you need? With a few simple steps, find the right product for your needs. 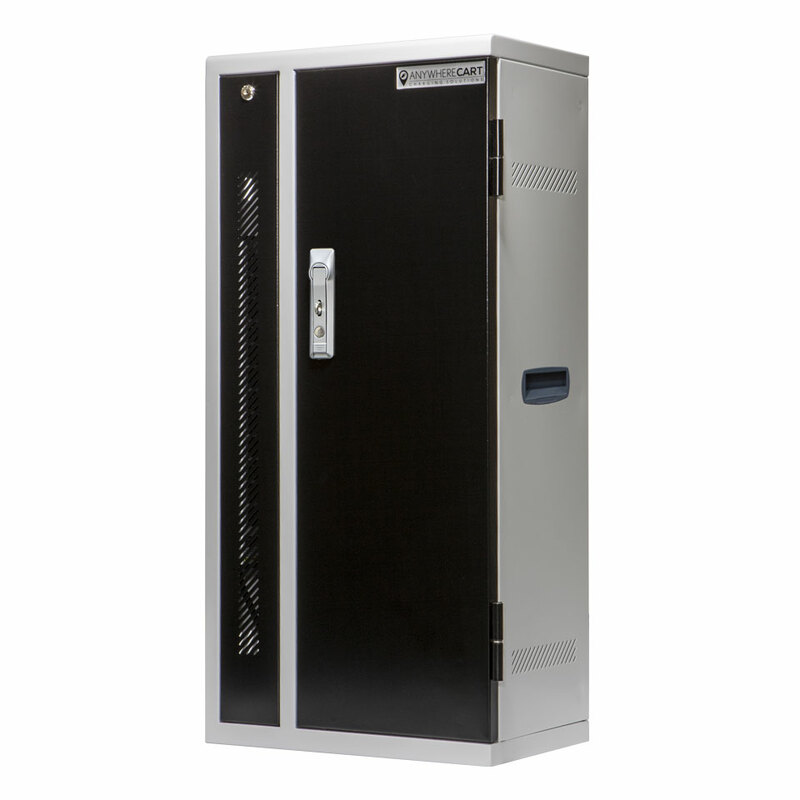 Do you need a Cart, Cabinet or Locker? 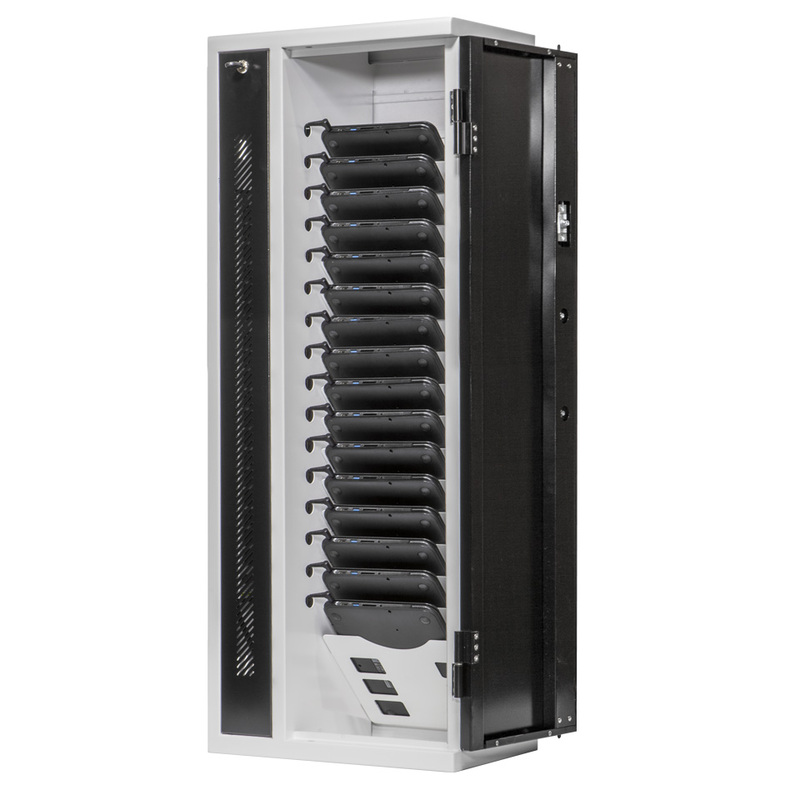 How Many Devices Per Cabinet?